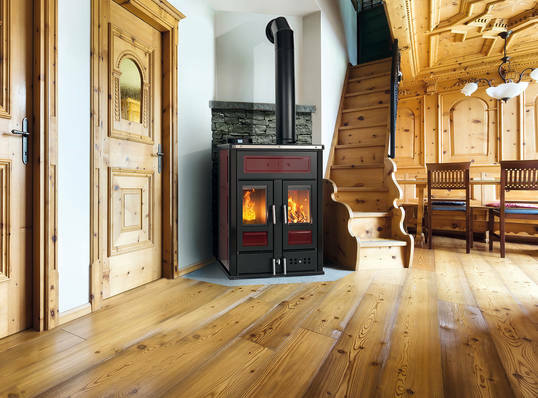 The Klover Bi-fire Mid combines a log boiler with a wood-pellet boiler. If you have your own wood supply, you can run the log boiler and use your own fuel. But when you are not at home, or during the night, the wood pellet boiler will come on automatically. Burning pellets, the Klover Bi-fire Mid will produce up to 10kW of heat to water and 3.5kW to the room. Burning logs, it will pass 7.5kW of heat to water and 4.5kW to the room, giving a combined output of 17.5kW to water and 8kW to the room.